Flipping houses looks easy, at least the way they do it on TV. On programs including A&E's "Flip This House" and Bravo's "Flipping Out," rehabbers snap up dilapidated properties, foreclosures and handyman specials, they remodel in a mad frenzy, and, if all goes according to plan, they sell for handsome profits. But while some properties can be flipped just that successfully, the reality can be a good deal more challenging. West Hartford-based real estate investor Ken Potter, a Realtor with Keller-Williams, has done four flips. On the most recent one, he made money, but "on the other three, I broke even or lost money," he says. "I got excited thinking, 'There's going to be a big profit like on TV.' It is not as easy as it looks." Christian Winkley, owner of Hartford-based Oxford Builders, has been in the business of custom building and contracting for 12 years. For the first time, he's flipping a residential property, on Girard Street in Hartford's West End. Winkley never intended to get into flipping. The deal came about as part of a set of special circumstances that have more to do with preserving the house and the quality of the neighborhood (where Winkley happens to live) than in making a profit. But even with modest financial aims, "I'm having a tough time bringing this in on budget with my experience," he says. By working with many of his regular subcontractors, "I'm getting some favors, I'm pulling some strings," he says. He's also doing a good amount of the work himself. Still determined to flip a house? The first challenge is finding the right property, veterans say. "Marketing to find good real estate deals is the most important part of the business," says Than Merrill, founder of New Haven-based CT Homes and one of the personalities featured on "Flip This House." Before purchasing any property, you need to decide how much you want to spend on the house and on improvements. "The bottom line on flipping a house is budget," Winkley says. For flippers of all stripes, crunching the numbers starts with setting a limit on what is paid for a property. "The way to make the best profit on any real estate deal is on your way into the deal," reads one of the Flip Tips at A&E TV's "Flip This House" site (www.aetv.com/flipthishouse). "If the seller won't sell at the price you need for your desired profit, walk away." In today's market, with values down in some areas and foreclosures and short sales arriving on the market, "competition is fierce," says Potter. Before bidding on any property, he does his homework, checking comparables and existing inventory. He recently toured two properties in East Hartford. "Only four similar properties had sold in the last six months, and there was a high inventory of similar properties [already on the market]," he says. "I decided not to bid." Flippers should familiarize themselves with the town and neighborhood where they're bidding. "It helps to know the area," Potter says. "I live in West Hartford. I know West Hartford. You have to understand what real estate sales prices will be." When a house on West Hartford's Auburn Road went into foreclosure, "there were 14 bidders," Potter says. "I was tempted to increase my bid to make sure I got it, but I didn't, and I'm glad I didn't. I wound up getting it anyway." Winkley's property on Girard Street found him. A couple who live next door sought out Winkley in an effort to put the house in good hands. "We're 'flippers of the heart'," says Winkley's wife, Kate, quoting a phrase she says she once heard on TV's "Will & Grace." "We'd like to break even and return a home in its original condition to the West End." Christian Winkley, who confesses he was "adverse to flips," was won over by a financing arrangement proposed by the neighbors and by the home's purchase price. "The house was on the market two years ago for $280,000," Winkley says. He and his financing partners bought it for $199,000. With the purchase price set, flippers recommend getting to work immediately, not waiting for the closing. At Auburn Road, Potter's flip took 2 1/2 months from purchase to sale. "It's textbook," he says, "But I spent a lot of time prior to acquiring the property, meeting with contractors and preparing. ... I had 11 guys working on the house a day after the closing. Sometimes they get in the way of each other," Potter says, but one of the keys is to minimize the amount of time you'll be paying the mortgage. When it comes to remodeling, the next step is calculating expenses and choosing where and how to spend. In a real estate market as volatile and changeable as today's, that part of the process can be fraught. "Rehab costs go up, sales prices go down," Potter says. "You can wind up with a thin margin or no margin." The temptation to over-upgrade a property is a potential trap. Don't install a Viking stove and Sub-Zero refrigerator if the overall value of the property can't support the upgrade. "Don't overdo it with high-end appliances," Potter warns. Beware "adding cost when there's really no return." 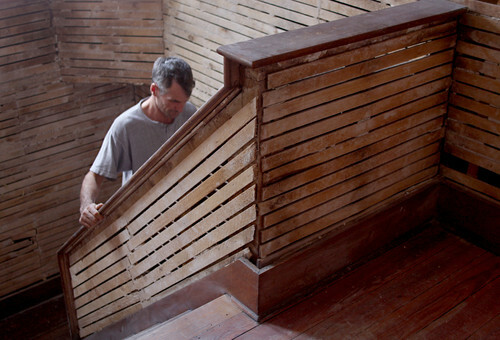 At Girard Street, Winkley has given himself a budget of $160,000 to refurbish the whole house. "It needed a lot, a lot of work," he says. He and his crew started by fully gutting the place and redoing the interior systems, from rewiring the electrical to installing central air-conditioning. In his refusal to cut corners, Winkley has spent a healthy portion of his budget on system repairs, the type that buyers never see but which constitute the right thing to do for the sake of the house. To keep his costs in line, he's not going over the top on finishes and appliances. "I ask myself, 'What's the most bang for the buck?'" Winkley asks. "I'm trying to moderate on finishes." Although he's created a new master suite complete with his-and-her walk-in closets and a spalike master bath, "I'm not going with Waterworks fixtures," he says. 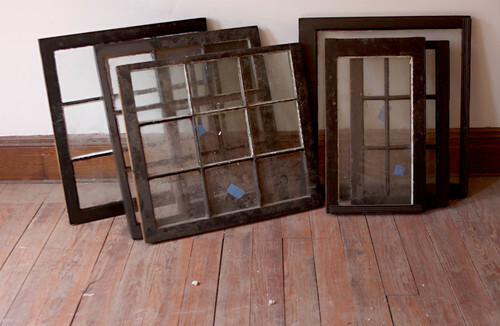 The last phase of any flipping project is pricing the property for a quick sale. Potter's experience has taught him to focus from the get-go on a sales price that's lower than what the property might actually sell for. "If you think it will sell for $325,000, bring it down to $315,000," he says. Keep that price in mind as you remodel, and when it comes to sale time, list the house for the lower amount to generate activity and introduce the possibility of multiple offers. The house on Auburn sold the first weekend it was open. Both Potter and Winkley warn home buyers who are considering the purchase of a flipped property to look beyond the surfaces. "The object of most flips is to make it look good," Winkley says. Flippers "don't always care what's behind the walls." 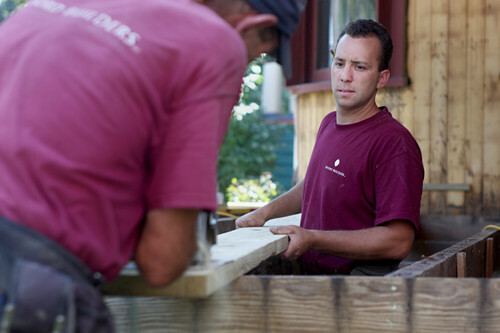 As a builder, Winkley knows, "there are so many ways you can cheat." His advice to potential buyers: "Check the mechanicals." Potter suggests potential home buyers go to the town records office and pull permits on the work done at the home. Only licensed contractors can get permits, and if there are none, "the whole thing starts to unravel," Potter says. His final advice for anyone joining the flipping game is to, "Go in knowing how you're going to get out." If your flipped house doesn't sell, prepare to be creative. Potter rehabbed a multi-family home and, when it didn't sell for the price he wanted, he converted it into a rental property for which he now serves as landlord. "Have an exit strategy," he says. Oil and water don't mix (but I knew that). When more than one person tells you that something is definitely impossible, it still might be possible. If I'm ever a captive on a pirate ship, I'll be really good at walking the plank. As is the case with so many people, I contemplate home improvements on the five- or even 10-year plan. I get an idea in my head, and it percolates for a long time — sometimes far longer than I would like — before coming to fruition. The i's were dotted; the t's were crossed; the house was mine. But then I spotted that long, deep depression in the vinyl, where some heavy piece of the sellers' furniture had been dragged out. I grumped, but heck, the floor was brand new. No big deal. Fast-forward about six or seven years. We'd spruced up the kitchen, and the floor was definitely the weakest link. Our kitchen is like Grand Central. You can't get anywhere without passing through it. The floor was beyond tired. I thought hardwood, or perhaps tile, might be nice. One guy told me that because I wasn't planning to yank out all the cabinets, I couldn't put down tile or hardwood. Another said, sure, he'd be glad to install tile, but my dishwasher would be permanently trapped behind the new floor. A third concurred: Unless I wanted to keep that dishwasher forever, the only flooring we could install would be another sheet vinyl. I suppose there is some reward for patience — or procrastination. I decided to call a builder whose work I've admired in the course of my work for the Home section — Christian Winkley of Oxford Builders. To my astonishment, he assured me it would be no problem to put in a hardwood floor, that my dishwasher would not be permanently locked in and that I didn't need to start the kitchen from scratch. More astonishing, the price wasn't all that much higher than the quotes I'd had on tile and sheet vinyl a few years earlier. But first, we would have to decide just what sort of floor we wanted. Still laboring under the assumption that we would need something very low-profile, I looked at lots of pre-finished and engineered wood floors. The choices are dizzying, and inspiring — bamboos, exotics, satiny finishes, rustic effects, various grades, various stains. But Christian said we could indeed use solid, 3/4 -inch wood. All the other floors in our house are oak, so we decided to stick with that, though we chose wider boards for a change of pace. Christian lined up Orvalino Candido Jr. — everyone calls him "Junior" — of OCJ Wood Flooring & Maintenance in Manchester for the job. In business since 1999, Junior hails from Tarumirim, a small town in Brazil. He came to the United States in 1992 at age 22, he says, and worked for a while at a dairy in Southbury. The farmer recommended that he start his own business, so Junior worked for a while with a cousin in New Jersey learning the flooring business before setting out on his own. His two-man crew — Valdir and Renaldo — also hail from Brazil. Junior says oak is still the most popular choice for floors. The pre-finish on pre-finished floors is "pretty good" and less susceptible to fluctuations in temperature, he says, "but you can't sand it down, and that's a drawback." And, he says, because pre-finished floors have a micro-beveled edge, you see all the lines. On the plus side, though, with a pre-finished floor, "At the end of the day, if you want to have a party, it's done." We were willing to wait for our party. We went with the unfinished oak. We also decided on the oil finish. A water-based finish dries more quickly and doesn't emit fumes while drying, but, Junior says, "I think the oil-based finish lasts longer." Our dishwasher and stove were parked in the dining room. The refrigerator was in the garage. The cupboards and nearby rooms were sealed up in plastic, secured with blue painters' tape. The cats were banished for a week. And because of the layout of our house, we slept in the basement. Christian arranged to set up a plank to one of our bathrooms, which, fortunately, has a shower. I didn't quite comprehend what they meant by fumes. Junior later told me he recommends that homeowners go stay somewhere else. Remember that I said that oil and water don't mix? Well, the floor was finally done. After each successive sanding came a layer of oil, and the final layer of oil had been carefully brushed on. We had said our goodbyes, and it was just a matter of time until the floor was dry. I walked the plank to the bathroom to quickly brush my teeth before heading to work. Then I heard an odd splashing sound. As it turned out, in a freak occurrence, water from the shut-off cold water line that had built up in the hot water line suddenly sprayed out onto the final coat of the freshly oiled floor. It looked awful. A few weeks later, it's just a distant memory. We love our floor. Junior and his crew came back and re-sanded and re-oiled the floor the next day. By the way, they had no idea beforehand that I would write about this experience. And I didn't know that I'd get so confident walking the plank. I'm ready for pirates. BUILDER CHRISTIAN WINKLEY updated this Hartford condo but only made minor renovations in the master bedroom, including replacing the dated trim and adding reading sconces over the bed and floating bookshelves. 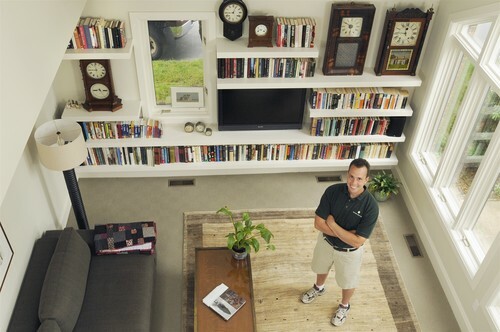 The couple were downsizing from their West Hartford home of 20 years. They hoped to move back to Hartford's West End, where they had lived years before, but some of the condominiums they visited had awkward layouts and bizarre spaces. The condo at the Allyn Estate on Asylum Avenue in Hartford had just the kind of open flow they wanted. There was a small patio garden where they could read and have their morning coffee. It felt like a house. But — and this was a big but — the condo was utterly dated and mired in the 1980s. Everything was beige, says the woman of the house — the furniture, the bathroom, the tile. Everything. The condo had the hollow six-panel doors and popcorn ceilings typical of that period. 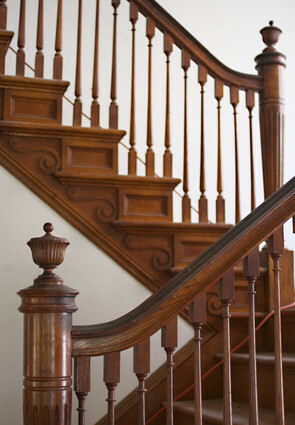 The railing of the staircase was a big, heavy slab. A vaulted ceiling made the master bath feel cavernous. "You couldn't get any more stereotypical," says Christian Winkley of Oxford Builders. Winkley says the owners — he's an attorney, she's a psychiatric social worker — knew exactly what they wanted: a look that was clean-lined, modern and smart. 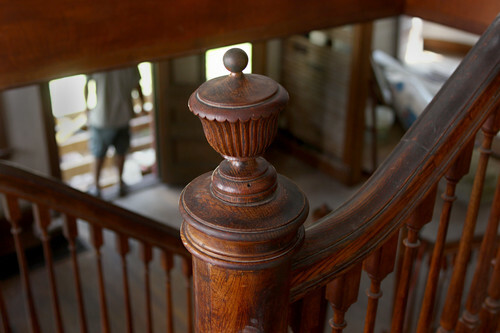 Winkley's company specializes in historic renovations of Victorian and older colonial homes, including fancy trim work, so, he says, the condo project "was outside of my usual style. It was pushing my boundaries." Yet the skills involved and the still-classic sense of proportions were the same. "It all transfers," Winkley says. "It's the same sort of building blocks, but there are no ogees or rounded edges. It's just not as ornate." The project didn't involve changing the configuration of the walls, windows or doors — just trims and casings. Even so, the thoughtful updates make a huge difference. 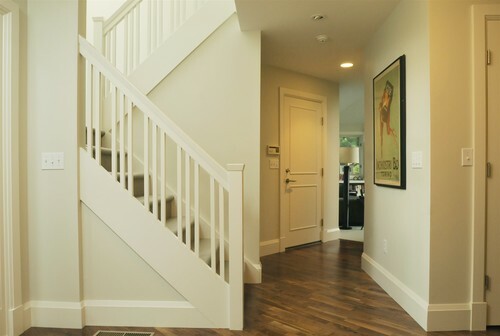 Winkley put a single bevel along the baseboards with the quietly elegant detail of an angled plinth block at the bottom of each doorway casing — classic and contemporary. 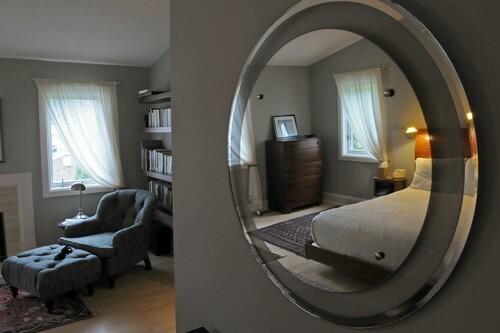 He used small raised molding on the doors to create a stylish two-panel effect. One of the real challenges was creating the floating shelves in the family room that now hold books, a media center and the couple's handsome collection of antique clocks. Winkley and custom cabinetmaker John Dean sunk steel pipe into the walls and then slid the hollow, custom shelves over the pipes. "There's no visual support," Winkley says. "It took a lot of forethought." Dean took the floating shelves in the master bedroom a step further — giving them a graceful curve that echoes the bowfront design of the couple's bedroom furniture. As Winkley says, when the shelves were added, they "just hugged the room." Throughout the house, recessed ceiling lights wash the walls and highlight a vibrant collection of antique advertising posters. German-made Häfele cabinets were installed in the kitchen, and some of the upper cabinets are designed with a dotted checkerboard glass front, so that dishes seem to glow from within on the glass shelves. Dean added a strip of steel to match the sleek pull-out Miele range hood. The granite counters from Ferrazoli Imports of New England in Middletown have light splashes of amber that pick up the wood grain, and a hint of green, echoing the elongated rectangular subway-style backsplash tiles by Ann Sachs in green and white glass. The master bath is like a mini spa, with a steam shower that has a floor of rounded stones for impromptu foot-massaging. The shower is finished in Lagos Azul limestone tile trimmed with glass tile by Walker Zanger. 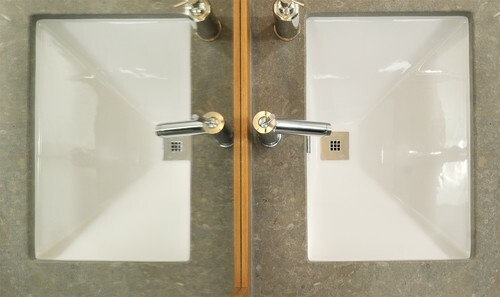 The beautifully angled, rectangular sinks are from Toto's Lloyd Collection, to which the couple added their own custom touch — stylishly rectangular drain covers. The man of the house came up with the idea for the bathroom's teak and walnut cabinetry. Here again, the cabinet just seems to float, though it's actually on a deeply recessed pedestal. 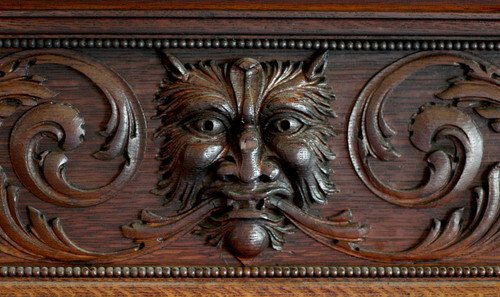 There are no latches or pulls, but instead the handles are carved out. The whole thing is topped with a handsome slab of Lagos Azul limestone. The couple were very decisive and knew what they wanted, Winkley says, so that the actual renovation work was wrapped up even more quickly than expected, in about six weeks. "We're so pleased with how it turned out," says the woman of the house. "Our first house in the West End, we did it piece by piece. Here, it feels like we rebuilt the house from the inside out." The house had asbestos siding, and all the architectural details were covered up. The porch was rotted, and the ceiling was caving in. But, says Kate Winkley, "the bones were there." Christian and Kate Winkley transformed their three-family home on Oxford Street in Hartford's West End, and then they started to transform the neighborhood: They now own three other houses on the block and another just around the corner, all renovated or in the works. "Multifamily houses are so often neglected; often they're non-owner-occupied," says Christian Winkley, noting that all but one of the houses on the block are multifamily dwellings. "This was a perfect block to bring back," Winkley says. "It just needed a little TLC," adds his wife. 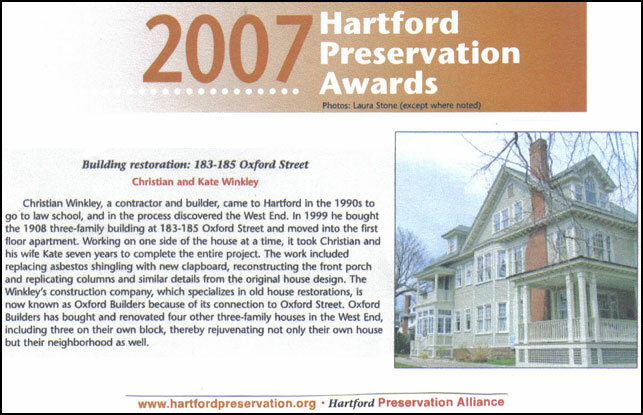 The Hartford Preservation Alliance will honor the Winkleys next Thursday with one of 14 awards for exceptional contributions to architectural preservation in Hartford during the past year.